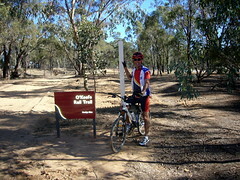 The City of Greater Bendigo and the Friends of the Bendigo-Kilmore Rail Trail are hosting a free community ride along the O'Keefe Rail Trail as part of the Spring in the Bendigo Bush program. The ride will explore the rail trail to Axedale and return through the beautiful Wellsford Forest using forest tracks and roads. The ride is suitable for people who are regular cyclists and have a good level of fitness. Time: 9.00 am to around 2.00 pm (approximately 5 hours by the time we look at features along the way and stop for refuelling). You'll need to book as places are limited. Contact Anthony Sheean on (03) 5434 6374 or 0419 762 787. Departure/meeting details will be provided when you book.